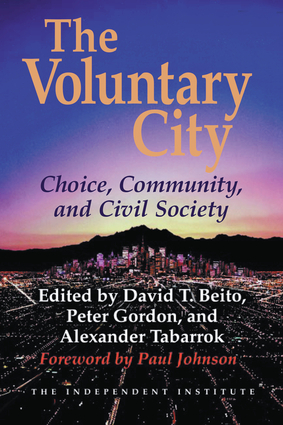 Assembling a rich history and analysis of large-scale, private and voluntary, community-based provision of social services, urban infrastructure, and community governance, this book provides suggestions on how to restore the vitality of city life. Historically, the city was considered a center of commerce, knowledge, and culture, a haven for safety and a place of opportunity. Today, however, cities are widely viewed as centers for crime, homelessness, drug wars, business failure, impoverishment, transit gridlock, illiteracy, pollution, unemployment, and other social ills. In many cities, government increasingly dominates life, consuming vast resources to cater to special-interest groups. This book reveals how the process of providing local public goods through the dynamism of freely competitive, market-based entrepreneurship is unmatched in renewing communities and strengthening the bonds of civil society. David T. Beito is associate professor of history at the University of Alabama. He is the author of Black Maverick: T.R.M. Howard's Fight for Civil Rights and Economic Power, From Mutual Aid to the Welfare State: Fraternal Societies and Social Services, 1890–1967, and Taxpayers in Revolt: Tax Resistance during the Great Depression. He is the author of several scholarly articles and his popular articles have appeared in the Atlanta-Journal Constitution, National Review, Perspectives, and Reason. He lives in Northport, Alabama. Peter Gordon is a professor in the University of California's School of Policy, Planning and Development. He and his colleagues have developed various economic impact models which they apply to the study of the effects of infrastructure investments or disruptions from natural events or terrorist attacks. Recent work involves the modeling and study of economic impacts. He has been published in most of the major urban planning, urban transportation, and urban economics journals. He lives in Los Angeles. Alexander Tabarrok is research director for the Independent Institute, assistant editor of the Independent Review, and associate professor of economics at George Mason University. He is the editor of Changing the Guard: Private Prisons and the Control of Crime and Entrepreneurial Economics: Bright Ideas from the Dismal Science. His papers have appeared in the American Law and Economics Review, the Journal of Law and Economics, the Journal of Health Economics, and the Journal of Theoretical Politics. He lives in Centreville, Virginia.